Dirty south electro swag — a term coined by Charlotte’s DJ Complete and A-Styles to define their distinctive subgenre of dubstep — a form of electronic dance music (EDM) that is infiltrating underground and mainstream airwaves. Complete and A-Styles emerged out of the club scene to form the EDM/hip-hop duo Styles & Complete in transition to heavy bass and sick drops. Not quite the aggressive slap-in-the-face dubstep by the likes of dubstep producers Bassnectar or Skrillex, Styles & Complete creates more rhythmic hip-hop-infused tracks that clearly sound like they could have been born out of the streets of Atlanta. But in fact Styles & Complete is purely Charlotte. Complete is the official DJ for the Charlotte Bobcats and mixes for Kiss 95.1. He is frequently found behind the booth at clubs around the city. A-Styles is a New Jersey native but moved to Charlotte as a child. He has been in the production game for over 10 years producing tracks for prominent southern hip-hop artists, more recently the Ying Yang Twins. The pair seemingly stumbled upon dubstep as their sound evolved. Instead of remixing tracks and making beats for other artists, Complete and A-Styles believed that they could build their own brand. As a group they would have full control as opposed to answering to the demands of other artists. 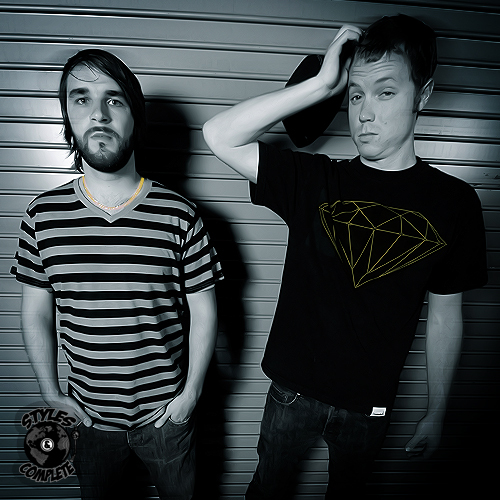 A-Styles and DJ Complete (left to right) step into the world of EDM. Photo courtesy DJ Complete. Styles & Complete’s first single “G.T.F.D.” (We’ll yet you figure what it stands for) dropped last September and sounds like house music with wobble bass, a major component of dubstep. Without a doubt it is an eligible choice for club DJs to mix with. Their latest single “Epic,” however, is more mature and heavy. The buildup is suspenseful and the drop is filthy — essential in dubstep music. In other terms the song has a slow, drawn-out pre-chorus leading up to a chorus that is contrastingly loud and rapid. And true to the group’s dirty south electro swag mantra, the song feels southern. The pair proudly represents Charlotte and carries their signature subgenre across the region, touring at various venues and colleges, including shows in North Carolina cities Raleigh, Greeneville, Chapel Hill and Wilmington and Charleston, S.C.
“We pretty much cover every nook and cranny,” said Complete. He adds that shows have been booked in Asheville, N.C. and at Clemson University, followed by stops in Missouri and Arkansas. “We’re working on SXSW right now,” he hints. But for now Styles & Complete is focused at home. The duo took the stage and opened for EDM artists Alvin Risk, Datsik and Steve Aoki at the Fillmore on Feb. 10, though a scheduling error caused the group to perform an hour before the 9 p.m. show was set to begin. More importantly Styles & Complete will headline its own show at Amos’ Southend on Feb. 25. It will be the first big show in Charlotte for the duo. As for the future Styles & Complete plans to release an EP, but the date has not been set.